Written by Kirsten Moodie owner of iZombieObsessed.com along with the thriving twitter account. 2. Because of her role choices she has played some unique parts. Such as Summer Lansdown in Power Rangers R.P.M. 3. She also played Tinker Bell in the TV series Once Upon A Time…A role she would be thrilled to reprise. 4. She also won an award for her role in the show Xena Warrior Princess, at the age of 11. 5. McIver also studied ballet as a child. Her role as a ballerina in the film Petals to the Wind, was not her first time training. 6. Rose has had some interesting jobs in between her acting gigs. One of those odd jobs was as a banana importer. 7. McIver enjoys writing and some of her favorite authors include, John Steinbeck, Wally Lamb and Franz Kafka. 8. Rose says that slipping into the role of a zombie was easy for her, but becoming a medical examiner was an entirely different story. 9. Her favorite TV Show is the Office. 10. Her favorite food is Marmite on Vogel’s toast (not brains). 11. If Rose could have one superpower, she would choose to fly. 12. If she could be any animal, she would be a chimpanzee. 13. It takes about 1 hour and 45 minutes to apply her zombie make-up for her role in iZombie, and 45 minutes to remove it. That is a lot of work and a serious commitment. 14. She is extremely quick witted and kind. Listening to interviews with Rose only makes you fall more in love with her. 15. She is unbelievably beautiful as well. This is just a small list explaining a few of the many reasons why we absolutely adore Rose McIver. Make sure to tune in on Tuesday nights to watch her in her role as Liv Moore of iZombie on the CW. The series will return for its second season on October 6th. 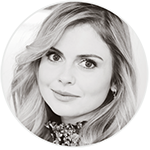 What are your favorite things about the stunning Rose McIver?